Radio has strengthened its position as Australia’s favourite and most listened to form of audio entertainment, with time spent listening on mobile devices increasing over the past year, according to a comprehensive study on listening trends released today. The second Australian Share of Audio study by GfK, which measures listening to all forms of audio including radio, owned music collections, streaming services, podcasts and online music videos, found Aussies spend 65.3 per cent of audio time – or two hours and 10 minutes per day – listening to live Australian radio. Radio’s share of listening increased from 64.9 per cent a year ago, driven by an increase in listening to radio via mobile streaming apps. The survey was conducted with a nationally representative sample of 1,500 Australians aged 10 and over from June 25 to July 22, before Pandora shut down its Australian services at the end of July. 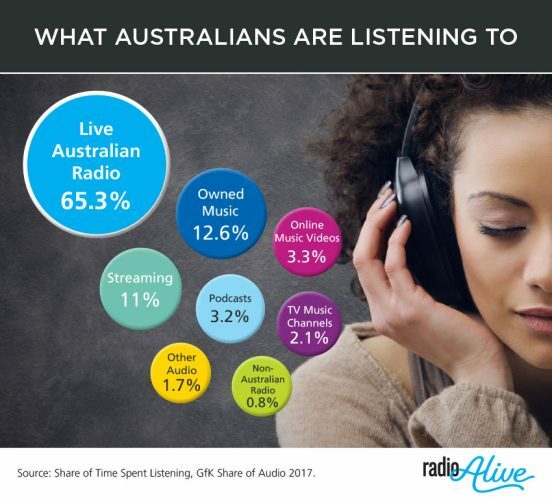 The study showed Australians spend nearly six times longer listening to live Australian radio than to the combined music streaming services Spotify, Apple Music and Pandora. It also found Australian radio has four times the daily audience reach of the combined streaming services, while nearly 60 per cent of Spotify listeners use the subscription service and cannot receive advertising. Overall, Australians spend three hours and 20 minutes listening to audio content each day. Time spent listening to owned music collections, such as CDs, albums and digital purchases declined slightly, but remained in second place. Owned music accounted for 12.6 per cent of listening or 25 minutes a day – down from 13.0 per cent a year ago. Spotify, Apple Music and Pandora combined accounted for 11.0 per cent of listening, or 22 minutes a day – up from a combined 9.2 per cent share a year ago. Online music videos such as YouTube were next with a 3.3 per cent share of audio time, followed closely by podcasts (3.2 per cent) and TV music channels (2.1 per cent). Commercial Radio Australia CEO Joan Warner said the research shows radio is continuing to dominate the battle for ears in a rapidly evolving audio landscape. “The amount of time spent listening to Australian radio via various mobile radio apps, while still relatively small, has also increased to 2.4 per cent of listening from 1.0 per cent a year ago,” she noted. Warner said the launch of the radio industry’s RadioApp in November last year was one way the industry was continuing to adapt to keep listeners tuning in. The free mobile app allows consumers to stream over 260 commercial, ABC and SBS radio stations on the go and expands the ‘live radio anytime, anywhere’ approach that has been a hallmark of radio’s enduring popularity.